In today’s incredibly crowded digital world, the key to cutting through the noise and resonating with consumers is highly-personalized, highly-creative, design-driven content. That’s why businesses that invest in creative are seeing major success, from reaching more consumers and achieving better engagement to closing more sales. 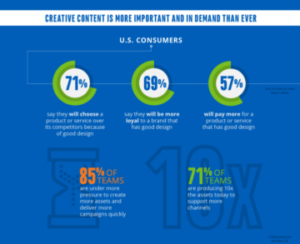 Get 13 stats on how today’s creative teams are driving more revenue with creative content. Download the infographic to see the true impact of creative teams.